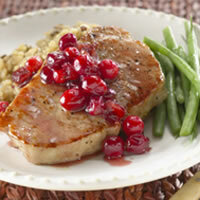 These chops are an easy weekday dinner that highlights autumn flavors of nutmeg, cider, and cranberry. Spray a large nonstick skillet with nonstick coating. Heat over medium-high heat. Sprinkle both sides of chops with pepper. Brown chops 2-3 minutes on each side in hot skillet. Add apple cider. Cover tightly; cook over low heat for 5-6 minutes or until internal temperature on a thermometer reads 160° F. Drain off juices. In a small bowl combine cranberry sauce, honey, orange juice concentrate, ginger and nutmeg. Pour over chops. Cook for 1-2 minutes, until heated through. Serving Suggestion: Serve with baked sweet potatoes and steamed cauliflower.